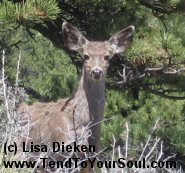 Early this spring I had a close encounter with a herd of deer and told my friend Tracie about it. ( http://www.mybloominglife.com/) The story of the encounter is for another post, for right now I'd like to share a beautiful poem that Tracie recently sent to me and a photo I took about two weeks ago. When for too long I don't go deep enough into the woods to see them, they begin to enter my dreams. Yes, there they are, in the pinewoods of my inner life. I want to live a life full of modesty and praise. Each hoof of each animal makes the sign of a heart as it touches then lifts away from the ground. Unless you believe that heaven is very near, how will you find it? Their eyes are pools in which one would be content, on any summer afternoon, to swim away through the door of the world. Then, love and its blessing. Then: heaven. Your deer's eyes are .... heaven.